Cut the avocados lengthwise around pits, then twist halves to separate. Strike the pits with a knife blade and twist to remove the pit. Cut the avocado flesh in a crosshatch pattern. With a spoon, gently scoop out the avocado from the skins. Place the avocados, the juice of two limes and the jalapeno in a blender and blend on high speed until as smooth as a mousse. Transfer to a bowl and cover with plastic wrap directly on the avocado mousse. Set aside. Slice the baguette on a 1/4-inch diagonal, then brush with olive oil and season with salt and pepper. Remove the skin of the grapefruit and slice along the membranes to remove the segments, making sure not to get any pith on your segments. On a hot grill, place the baguette slices and grill until they are lightly toasted. At the same time add the shrimp on the grill, cooking for one minute on the first side and 30 seconds on the second side. Remove the shrimp from the grill and squeeze fresh lime juice over them and season with salt. Smear the avocado mousse on the grilled baguettes. 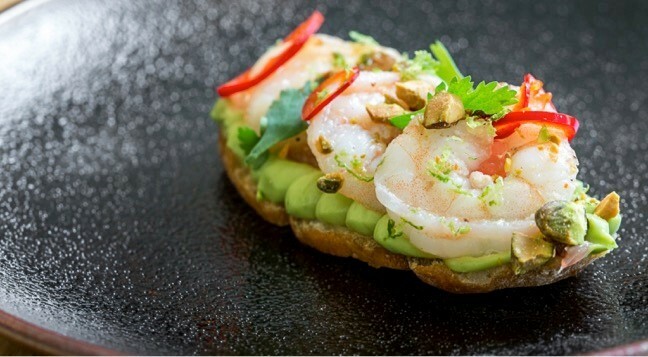 Place two pieces of shrimp interlocking each other on the avocados. Put one segment of grapefruit and a sprinkling of pistachios on each bruschetta. Garnish with the cilantro and pickled peppers.